Gander International Airport (IATA: YQX, ICAO: CYQX) is located in Gander, Newfoundland and Labrador, Canada, and is operated by the Gander International Airport Authority. Canadian Forces Base Gander shares the airfield but is a separate entity from the airport. Construction of the airport began in 1936 and it was opened in 1938, with its first landing on January 11 of that year, by Captain Douglas Fraser flying a Fox Moth of Imperial Airways. Within a few years it had four runways and was the largest airport in the world. Its official name until 1949 was Newfoundland Airport. In 1940, the operation of the Newfoundland Airport was assigned by the Dominion of Newfoundland to the Royal Canadian Air Force (RCAF) and it was renamed RCAF Station Gander in 1941. The airfield was heavily used by RAF Ferry Command and Air Transport Command for transporting newly built aircraft across the Atlantic Ocean to the European Theatre, as well as for staging operational anti-submarine patrols dedicated to hunting U-boats in the northwest Atlantic. Thousands of aircraft flown by the United States Army Air Corps through the changeover to the United States Army Air Forces, and the RCAF destined for the European Theatre, travelled through Gander. Following the war, the RCAF handed operation of the airfield back to the dominion government in March 1946, although the RCN's radio station remained and the military role for the entire facility was upgraded through the Cold War. The Canadian federal government changed the name to Gander Airport after Newfoundland joined Canada in 1949. It opened the current passenger terminal in 1959. On 16 September 1945 the first transatlantic proving flight, a Pan Am DC-4, departed Gander for Shannon in western Ireland. On 24 October 1945, the first scheduled commercial flight, an American Overseas Airlines DC-4, passed through Gander. Following Newfoundland's entry into Confederation, the government renamed the airport Gander International Airport and it came under the administration of Canada's federal Department of Transport. Numerous improvements were made to the runways and terminals. Aeroflot operated Ilyushin Il-86 widebody flights during the 1980s and early 1990s between Moscow and such long-range destinations as New York and Havana (HAV). Due to the IL-86's limited range of approximately 2,000 miles (3,200 km), the flights would make refueling stops at both Shannon and Gander en route to the final destination. The Boeing 747-200s of the same era had typical ranges from 5,0006,000 miles (8,0009,700 km) and were much more sought after by international airlines. The IL-86 was used almost exclusively by Aeroflot and successor post-Soviet airlines. 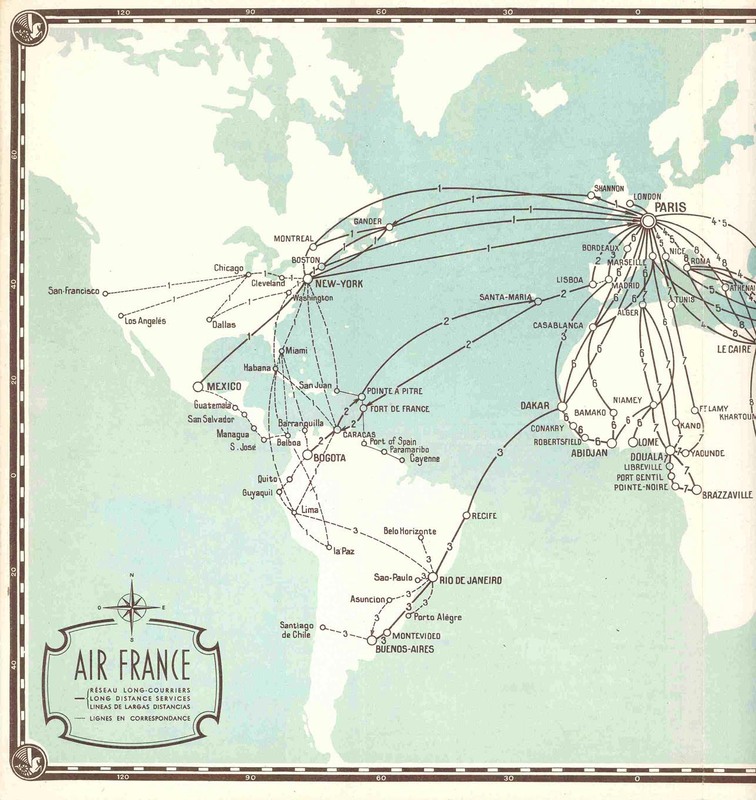 Air France ran several services through Gander connecting Paris and Shannon to Montreal, Boston, and New York in the 1950s. American Overseas Airlines used Gander as a stop for Lockheed Constellation flights between New York and London from 1947. 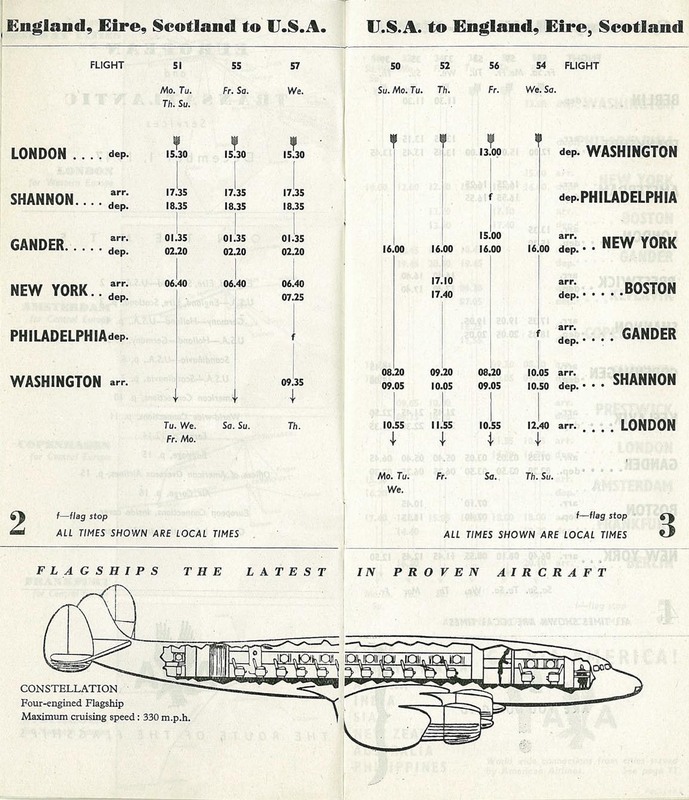 British Overseas Airways Corporation operated Constellations on London-Shannon-Gander-New York, London-Glasgow-Gander-New York, and London-Glasgow-Gander-Montreal routings from 1947. By 1960, the Gander stop was only used as an alternative to a Glasgow or Shannon stop for Bristol Britannia service to Montreal and Toronto. Interflug flights between East Germany and Cuba would stop to refuel in Gander until the airline began using Airbus A310s in 1989. KLM used Gander as a stop on Amsterdam-Glasgow-Gander-New York service from 1946. Pan American World Airways used Gander as a stop for transatlantic Douglas DC-4 service between New York-Idlewild and Shannon (continuing to London and Lisbon) starting in 1946. Gander remained in use in 1960 as a stop for Douglas DC-7 services between New York and Scandinavia, although other transatlantic flights bypassed Gander by that point. Sabena operated Brussels-Shannon-Gander-New York service from 1949 using Douglas DC-6s. Scandinavian Airlines operated Stockholm-Oslo/Copenhagen-Prestwick-Gander-New York service from 1946. Trans-Canada Air Lines used Gander as a stop for transatlantic service to London from 1946 and also operated local service from Gander to St. John's and Sydney. 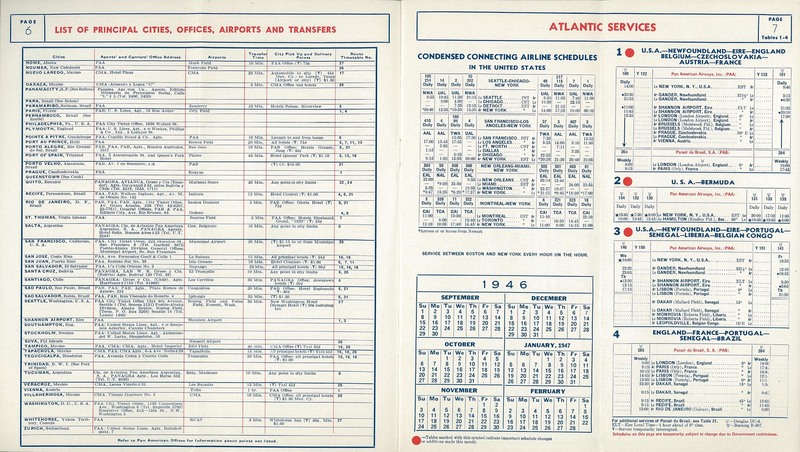 Trans World Airlines operated Boston-Gander-Shannon and Boston-Gander-Azores-Lisbon services from 1947 using Constellations, with onward service to destinations in Europe, the Middle East, and India. Runway 04/22 was extended from 8,400 to 10,500 ft (2,560 to 3,200 m) in 1971. With the advent of jets with longer range in the 1960s, most flights no longer needed to refuel. Gander has decreased in importance, but it remains the home of Gander Control, one of the two air traffic controls (the other being Shanwick Oceanic Control in western Ireland) which direct the high-level airways of the North Atlantic. Most aircraft travelling to and from Europe or North America must talk to at least one of these air traffic controls. Some commercial transatlantic flights still use Gander as a refuelling stop; most notably, some American legacy carriers (United Airlines and Delta Air Lines in particular) who use the Boeing 757 to connect smaller European cities with their major US hubs. The 757 is particularly affected in this respect, as it was not an aircraft intended or designed for transatlantic flights. This practice has been controversial, since strong headwinds over the Atlantic Ocean during the winter months can result in the flights being declared "minimum fuel", forcing a refuelling stop at Gander in order to safely complete their journey. During the Cold War, Gander was notable for the number of persons from the former Warsaw Pact nations who defected there (including Soviet chess player and pianist Igor Vasilyevich Ivanov, Cuban Olympic swimmer Rafael Polinario, and the Vietnamese woman famously photographed as a naked girl fleeing a napalmed village, Phan Thi Kim Phuc). It was one of the few refueling points where airplanes could stop en route from Eastern Europe or the Soviet Union to Cuba. In 1985, Gander was the site of the Arrow Air Flight 1285 disaster on 12 December, in which a McDonnell Douglas DC-8 with 256 on board crashed during takeoff, probably due to atmospheric icing; there were no survivors. The crash was, and remains, as of March 2019[update], the deadliest airplane accident on Canadian soil. On September 11, 2001, with United States airspace closed due to the terrorist attacks, Gander International played host to 38 airliners, totaling 6,122 passengers and 473 crew, as part of Operation Yellow Ribbon. Gander International received more flights than any other Canadian airport involved in the operation apart from Halifax. The 6,595 passengers and crew accounted for the third highest total of passengers that landed at a Canadian airport involved in the operation, behind Vancouver and Halifax. A major reason that Gander received so much traffic was its ability to handle large aircraft, and because Transport Canada and Nav Canada instructed pilots coming from Europe to avoid the airports in major urban centres of Central Canada, like Toronto Pearson International Airport and Montréal-Dorval. The reception these travellers received in the central Newfoundland communities near the airport has been one of the most widely reported happy stories surrounding that day, and was dramatized in the musical Come from Away. To honour the people of Gander and Halifax for their support during the operation, Lufthansa named a new Airbus A340-300 "Gander/Halifax" on May 16, 2002. That airplane is listed with the registration D-AIFC, and was the first aircraft of that fleet with a city name from outside of Germany. Officials at Gander International Airport have stated that the future for the airport is grim unless the federal government provides funding to cover costs. Over 50% of all aircraft operating from the air field are military, and do not pay landing fees. However, domestic passenger traffic increased by over seven percent in 2006, while weekly cargo flights from Iceland show some promise of expansion. In April 2014, Gander Airport Authority decided on plans to abandon the existing terminal building due to high operating costs and replace it with a new terminal a quarter of the size. The fate of the old building is uncertain. The terminal, which was built in the 1950s and has drawn continuing worldwide interest for its modernist design, has been recognized by other Canadian institutions as a valuable piece of heritage architecture and has many of its original furnishings and fixtures still intact. Early in 2016 it was revealed that Gander Airport would be losing WestJet Encore flights with service to Halifax International Airport, to Deer Lake Regional Airport due to low passenger numbers for the Q-400 operated flights, but however reinstated its flight in May 2017 and as well dropped its mainline flight to Toronto. Gander has two active runways: runway 13/31 which is 8,900 ft × 200 ft (2,713 m × 61 m), and runway 03/21 (changed from 04/22 in August 2004) which measures 10,500 ft × 200 ft (3,200 m × 61 m) and undergone a $10 million comprehensive rehabilitation project completed in September 2012. The airport's runway 03/21 was designated as an emergency landing runway for NASA's Space Shuttle orbiter. The airport is also an important emergency landing runway for large aircraft in transatlantic operation in the ETOPS system, which requires aircraft to always have less than a certain distance from a suitable landing site. For many two-engine aircraft this is two or three hours with malfunction in one engine. Gander Airport Safety and Airside Operations is responsible for fire and rescue operations using three vehicles at their station within the airport. It also has a mutual aid agreement with the Town of Gander Fire Department to provide additional fire fighting services. The airport fire crew is a mix of full-time and volunteers with total crew of 14. Since the airport's founding in 1938 and through the course of World War II and subsequent beginnings of transoceanic air travel, there have been dozens of crashes around Gander of fighters, bombers, freighters, sea planes, radar aircraft, civilian airliners, and private craft. On 21 February 1941, three people were killed when a Lockheed L-14 Super Electra/Hudson departing from Gander crashed near Musgrave Harbour after both of the plane's engines failed. The fatalities include Sir Frederick Grant Banting who died of wounds and exposure. The navigator and co-pilot died instantly, but Banting and the pilot, Captain Joseph Mackey, survived the initial impact. According to Mackey, the sole survivor, Banting died from his injuries the next day. On 18 September 1946, 27 people lost their lives when a SABENA Douglas DC-4 (OO-CBG) crashed 35 km short of Gander Airport, where the aircraft planned to land for a refueling stop on the flight from Brussels to New York. At the time of the accident (07:42 UTC), there was dense fog near the airport, and the pilot executed a flawed approach at too low an altitude. There were 17 survivors (16 passengers and one crew). On 5 September 1967 an Ilyushin Il-18 (registration OK-WAI) of Ceskoslovenske Aerolinie (SA) Flight 523 crashed on climbout heading east on runway 13 while on a Prague-Shannon-Gander-Havana passenger service, killing 37 of 69 on board; the cause was never determined. On 12 December 1985 Arrow Air Flight 1285 crashed on take-off from the then runway 22. The disaster claimed the lives of 8 crew and 248 soldiers of the United States Army's 101st Airborne Division who were returning home for Christmas from a peacekeeping deployment in the Middle East. The impact on the south side of the Trans-Canada Highway on the shore of Gander Lake left a charred clearing in the forest where a memorial now stands to those who lost their lives in Canada's most deadly air crash. On 31 March 2007, an Antonov An-124 Ruslan operated by Volga-Dnepr Airlines inbound from Greer, South Carolina, landed on runway 03/21 but failed to stop and ran off the runway. ^ a b Canada Flight Supplement. Effective 0901Z 3 January 2019 to 0901Z 28 February 2019. ^ " ". www.doopedia.co.kr (in Korean). Retrieved April 29, 2018. ^ "Shannon Airport". Clare County Library. Retrieved July 10, 2018. ^ "Air France timetable, 1953". Timetableimages.com. Retrieved June 17, 2015. 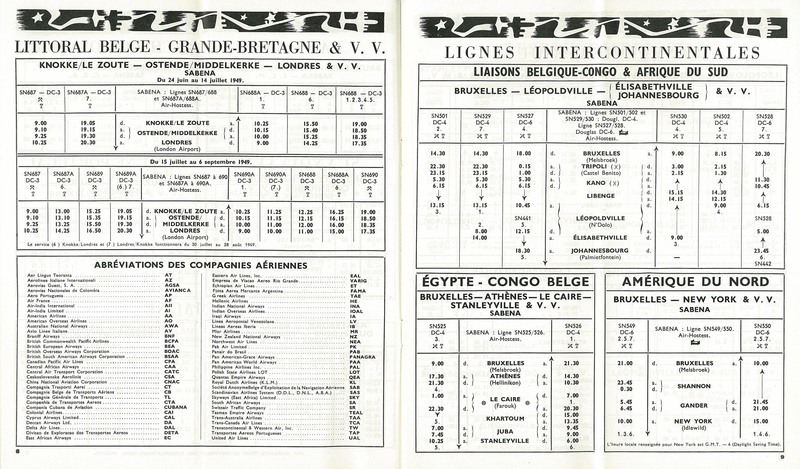 ^ "AOA timetable, 1947". timetableimages.com. Retrieved June 17, 2015. 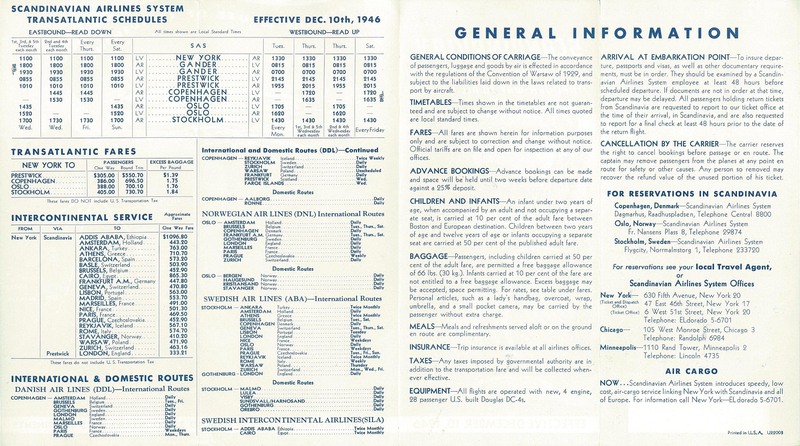 ^ "BOAC timetable, 1947". timetableimages.com. Retrieved June 17, 2015. 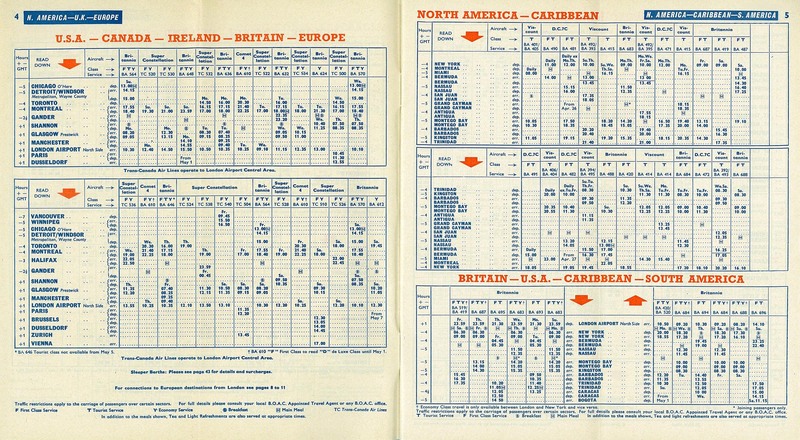 ^ "BOAC timetable, 1960". timetableimages.com. Retrieved June 17, 2015. ^ Kern, Ingolf (June 23, 2008). "50 Jahre Interflug: Was von der DDR-Staatsfluggesellschaft blieb". Frankfurter Allgemeine Zeitung (in German). Retrieved September 19, 2013. 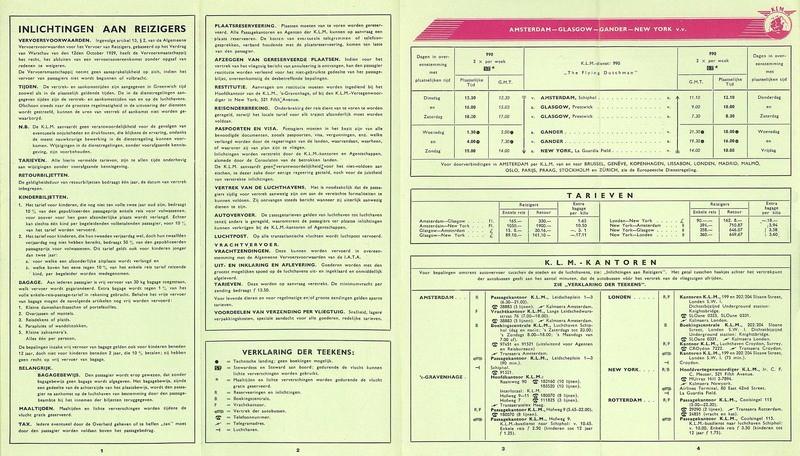 ^ "KLM timetable, 1946". timetableimages.com. Retrieved June 17, 2015. ^ "Pan Am timetable, 1946". timetableimages.com. Retrieved June 17, 2015. ^ "Pan Am timetable, 1960". timetableimages.com. Retrieved June 17, 2015. 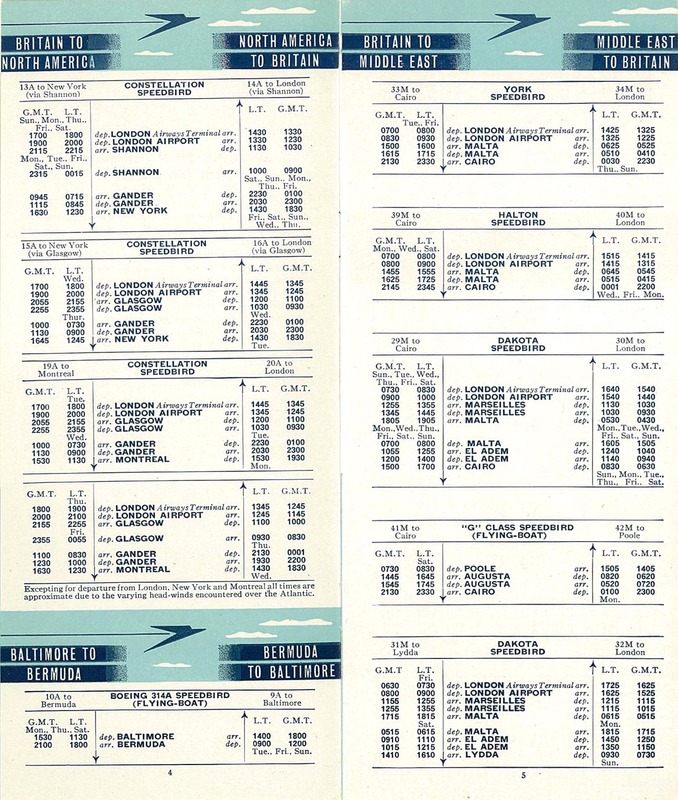 ^ "Sabena timetable, 1949". timetableimages.com. Retrieved June 17, 2015. 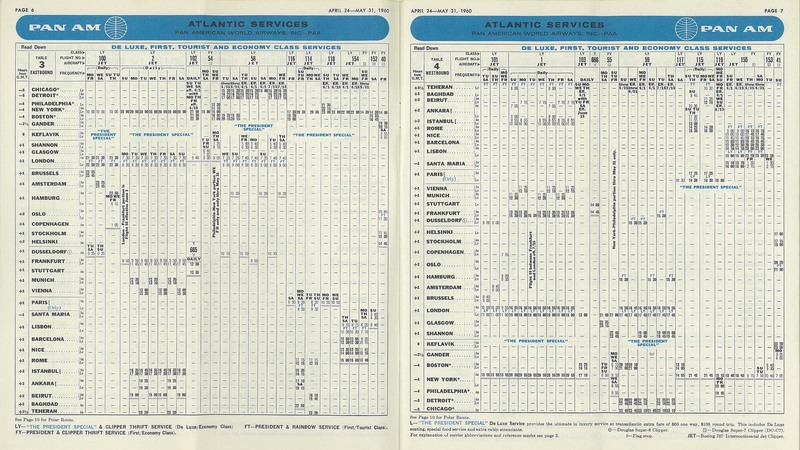 ^ "SAS timetable, 1946". timetableimages.com. Retrieved June 17, 2015. 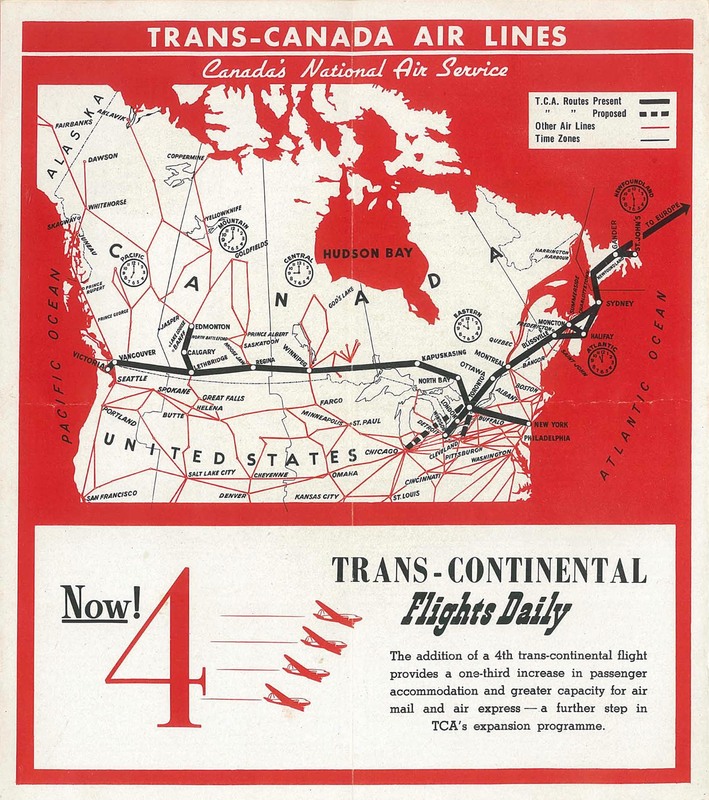 ^ "Trans-Canada Air Lines timetable, 1946". timetableimages.com. Retrieved June 17, 2015. 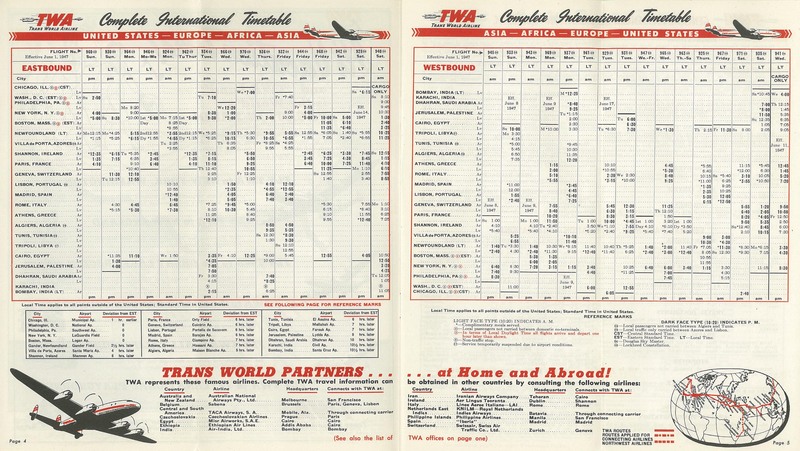 ^ "TWA timetable, 1947". timetableimages.com. Retrieved June 17, 2015. ^ Higgins, Michelle. "The Flights Are Long. The Planes Are Cramped". New York Times. Retrieved July 29, 2007. ^ Clark, Andrew. "Continental transatlantic flights run low on fuel". The Guardian. Retrieved April 8, 2008. ^ Paur, Jason. "High Winds Forcing Pitstops On Transatlantic Flights". Wired. Retrieved February 23, 2016. ^ Delaware, Andrew. "Real Athlete: Olympic Swimmer & Water Polo Player Rafael Polinario". RealJock.com. Retrieved December 17, 2009. ^ "NAV CANADA and the 9/11 Crisis". Nav Canada. 2009. Retrieved March 19, 2009. ^ "Gander airport to be traded-in for new terminal". CBC News. April 29, 2014. ^ Stevens, James (July 6, 2006). The Maw: Searching for the Hudson Bombers. Trafford. pp. 4143. ISBN 978-1412063845. ^ "ASN Aircraft accident Douglas DC-4-1009 OO-CBG Gander, NF". Aviation-safety.net. September 18, 1946. Retrieved July 23, 2014. ^ Accident description for OK-WAI at the Aviation Safety Network. Retrieved on September 23, 2013. ^ "Aviation Investigation Report A07A0029". Transportation Safety Board of Canada. Retrieved July 5, 2018. Wikimedia Commons has media related to Gander International Airport. This article based on this article: Gander_International_Airport from the free encyclopedia Wikipedia and work with the GNU Free Documentation License. In Wikipedia is this list of the authors .